We have turned a historic two - star hotel in the very heart of Jerusalem into a modern, clean, young-in-spirit, beautiful guest house. We have everything a traveler needs, and we’re surrounded by everything you want to explore, taste, and enjoy in this unique city -and all for an affordable price.Facilities:The Jerusalem Hostel has the feeling of a respectable, established hotel: An impressive entryway with curved stone columns, wall-to-wall carpeting, wide, well-lit corridors and high ceilings (But don’t worry—you’re in the right place! The Jerusalem Hostel!) Apart from the comfort of your room, you are welcome to enjoy the following amenities:Our street-level lobby with internet service: free if you have a laptop; for a modest fee if you use our computer. Our huge roof, perfect for sunbathing or your daily exercise. Our kitchen and dining room. Because we can’t compete with the many restaurants, markets, and food stands nearby, we do not serve meals. 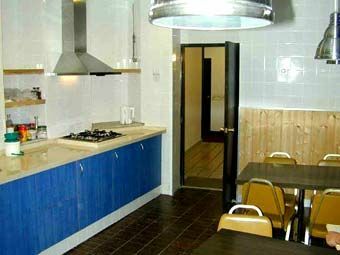 However, our fully equipped, clean, modern kitchen is available for your use, with a pleasant space for dining as well. A 24-hour supermarket is a block away. A safe for your valuables. Rooms: All of our rooms have attached toilets and showers. Our central heating and air conditioning system operates only on hot days for cooling and cold days for heating. Most of the year you will find the Jerusalem climate pleasant and dry.PLEASE NOTE: Our dormitories are designed for use by younger travellers looking for a few cheap nights' accommodation. We do not accept reservations for dormitory spaces for more than one week.We offer three classes of private rooms and dormitory beds. Please make your reservation at least 72 hours before your intended arrival date. 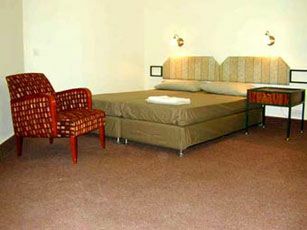 Thank you.Class A room: A spacious family-style room with a double bed plus one or two bunk beds, a balcony, and cable TV. Class B room: A double bed; some also have bunk beds. Most class B rooms have balconies. All have cable TV. Class C room: A smaller room for one or two people. Dorm rooms: Separate women’s and men’s rooms with attached shower and toilet. Lights must be turned off at 23:00. There is no curfew or lockout, but we ask that you be considerate of your fellow travelers. From Tel Aviv: Take the sherut taxi from Tel Aviv to the last stop, Zion Square. Don’t bother to put on your backpack - we’re ten steps away. From the Jerusalem Central Bus Station:Take bus number 6 or 20 to Zion Square.By car: Follow the directions from our map. Parking is available on HaRav Kuk Street. It’s expensive if you come in the morning (ask for a day permit), cheap after 14:00, and free after 21:00 and on weekends.